Forest Owlet (Athene blewitti) complete detail. 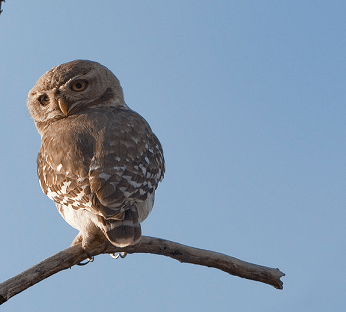 Description of Forest Owlet (Athene blewitti). 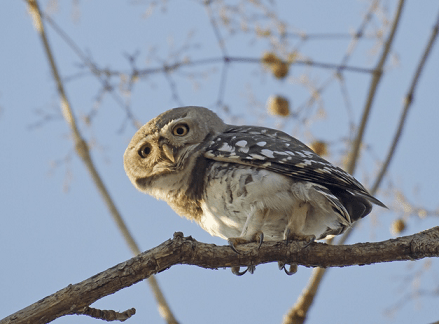 Classification of Forest Owlet (Athene blewitti). Identification of Forest Owlet. Habit and habitat of Forest Owlet. Forest owlet’s preferred habitat is the dry deciduous teak forests. The cheeks of the Forest Owlet thus contrast little with the surrounding areas, and the face has a blander expression and is mostly paler. The Forest Owlet has a more conspicuous dark line down the center of the face from the forehead, split by the bill. The Forest Owlet has large central white spots on each of the scapulars, forming a prominent row of white spots bordering the wing, and very large white spots on the upper wing coverts near the leading edge of the wing…………. Wings and tail are heavily banded and contrast starkly with its white underparts, making its overall appearance quite distinctive while in flight. They have a relatively large skull and beak. The crown through to the hind neck of the Forest Owlet is nearly uniform dull brown, with only inconspicuous, small whitish dots. Both sexes are similar, but males are smaller than females with fewer markings on belly and breast……….. Breeding occurs between October and March. The incubation period is between 30 to 32 days, after hatching, the young are dependent on the female for at least a further 40-42 days. During the incubation period, the male used to roost with the female inside the nest hole but, as soon as the chick hatched, he was kept away from the nest by the female. The male never fed the chicks directly in the nest. He always brought food to the female, which……………..
Conservational Status – Schedule – I, according to wildlife (Protection) act, 1972 and classified Threatened (Critically Endangered) According to the IUCN. Size between 22 to 25 cm. Forest Owlet is a beautiful bird. Athene blewitti has square-headed dark grey-brown owlet with faintly spotted crown and mantle. The upper parts are dark grey-brown. The upper breast is almost solid brown and the sides are barred with a white central wedge in the lower breast that is sometimes unmarked, especially in males. The cheeks of the Forest Owlet thus contrast little with the surrounding areas, and the face has a blander expression and is mostly paler. The Forest Owlet has a more conspicuous dark line down the center of the face from the forehead, split by the bill. Wings and tail are heavily banded and contrast starkly with its white underparts, making its overall appearance quite distinctive while in flight. They have a relatively large skull and beak. The crown through to the hind neck of the Forest Owlet is nearly uniform dull brown, with only inconspicuous, small whitish dots. The Forest Owlet has large central white spots on each of the scapulars, forming a prominent row of white spots bordering the wing, and very large white spots on the upper wing coverts near the leading edge of the wing. Both sexes are similar, but males are smaller than females with fewer markings on belly and breast. 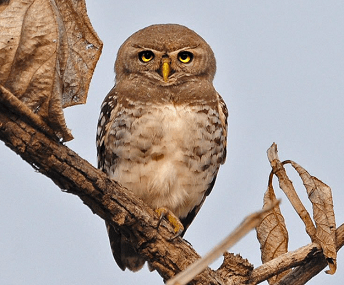 Forest Owlet found in central India, including Madhya Pradesh, Maharashtra, Chhattisgarh and Orissa. Forest Owlet preferred forest habitat has an upper canopy at 15-26 meters with a 10-20 meter understory. The current range covers open teak forest at about 400-600 meters altitude. 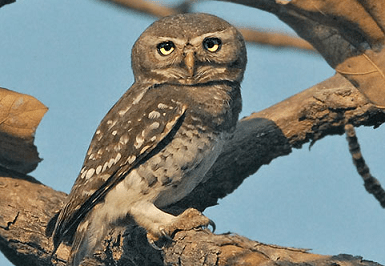 Forest owlet’s preferred habitat is the dry deciduous teak forests. They make several different calls. The territorial calls have been transcribed as “kwaak … kk, kwaa..kk”. A contact call of “kee yah, kee…yah” is given when the male brings food to the female at nest. The alarm calls is a “chirrur… chirrur, chirr…chirr” while a begging “kee…k, kee…k” calls is made when young or females seek food. Forest Owlet, often hunting during daytime. They Feeds on lizards, small rodents, amphibians and some invertebrates. Breeding occurs between October and March. Female lays two eggs in a hole in a softwood tree. The incubation period is between 30 to 32 days, after hatching, the young are dependent on the female for at least a further 40-42 days. During the incubation period, the male used to roost with the female inside the nest hole but, as soon as the chick hatched, he was kept away from the nest by the female. The male never fed the chicks directly in the nest. He always brought food to the female, which used to call close to the nest and then feed the chicks after taking the food from him.